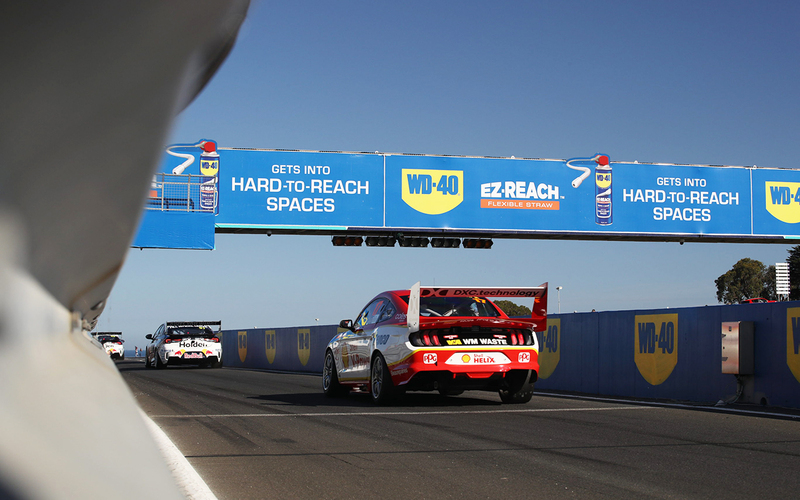 For the second consecutive event, Supercars will trial a new rule at this weekend’s WD-40 Phillip Island SuperSprint. At the Tyrepower Tasmania SuperSprint last weekend, a parc ferme trial prevented set-up changes to cars between qualifying and racing. A second trial of that is planned for later in the season at the Century Batteries Ipswich SuperSprint, following an analysis of Symmons Plains. At Phillip Island, the pitlane will be closed under Safety Car conditions, a rule last in place at Supercars events during the early 2000s. Why is it being trialled? The move has been made in the name of safety, designed to avoid the congestion that takes place when a Safety Car triggers a flurry of pitstops. With each car sharing its pit bay with another, they are often forced to ‘double stack’ and wait for service, clogging up the pitlane. Stacking triggered a high-profile incident at the Adelaide season opener, when Chaz Mostert was spun by Rick Kelly after rejoining straight into the path of the Nissan. Supercars had already committed to the Safety Car pitlane closure trial last December, where it was signed off by the Commission. Head of Motorsport Adrian Burgess says Phillip Island has been chosen for the trial due to the tight nature of its pitlane. “Last year we saw at quite a few events, most notably here, and even Newcastle at the last event, when you double-stack cars under a Safety Car you’re putting everyone at risk,” he said. Compulsory pitstops (CPS) are scheduled for both races, as per the regular SuperSprint format, with the CPS window opening after five laps. Saturday’s 120km race requires one stop to change at least two tyres, while Sunday’s stipulates two in order to undertake a 120-litre fuel drop. “If the Safety Car comes out, you won’t be able to come into the pitlane to do a pitstop that contributes to the CPS,” explained Burgess. The rule will be policed based on two key elements – the notification on official timing screens that a Safety Car has been called, and the position of cars relative to the SC1 line. If a car crosses the SC1 line – marked across the race track just prior to the pit entry – after the timing goes yellow, they may not pit and perform CPS duties. A car may not pit and undertake a CPS until after they have crossed the start/finish line at the end of the Safety Car period. Will it impact the racing? Whether or not a Safety Car is called during either race, the new rule is almost certain to impact pit strategies. The general expectation is that teams will pit their cars as soon as possible in the races, in order to avoid the risk of being caught without having stopped when a Safety Car is called. Noted Fox Sports pundit Craig Lowndes: “It’s a little bit like Russian Roulette because you want to stay out for tyre life and pit as late as you can and get the speed at the end. “But if a Safety Car comes out right when you don’t want it to, you’re stuck. If you haven’t done your stop prior to a Safety Car, you’re out of the race [contention]. Rick Kelly, who ended Friday practice fourth fastest, believes some may take a risk in order to make up track position. “It provides an opportunity to take a risk and get rewarded for it by going longer and risking a Safety Car,” he said. “The deg around this place has normally been reasonably high, so if you go longer and have a decent overcut, take the high-risk strategy and there is no Safety Car, you could be rewarded. What odds on a Safety Car anyway? The Safety Car has appeared in 15 of the last 23 races held at Phillip Island, covering 2008 to '18. Red flags were required in both Friday practice sessions due to geese wandering onto or near the circuit which, if repeated in a race, will trigger a Safety Car. Safety Cars have, however, been few and far between so far this season. The Superloop Adelaide 500 and Tyrepower Tasmania SuperSprint were devoid of any full course yellows, while the Beaurepaires Melbourne 400 included Safety Cars in two of its four races.